I didn’t manage to get a great picture of it because I was too busy shoveling it into my mouth. I LOVE this recipe, y’all! I served it for dessert, along with homemade vanilla ice cream (neither vegan nor paleo! ), but it would also be great with whipped coconut cream. I also had it plain for breakfast a couple of times, along with some sausage. I’m super-sad it’s all gone now, because I would love to have some this morning. Fortunately for me, I’ve got some paleo Banana Bread (also from Against All Grain: Delectable Paleo Recipes to Eat Well & Feel Great ) in the oven right now! 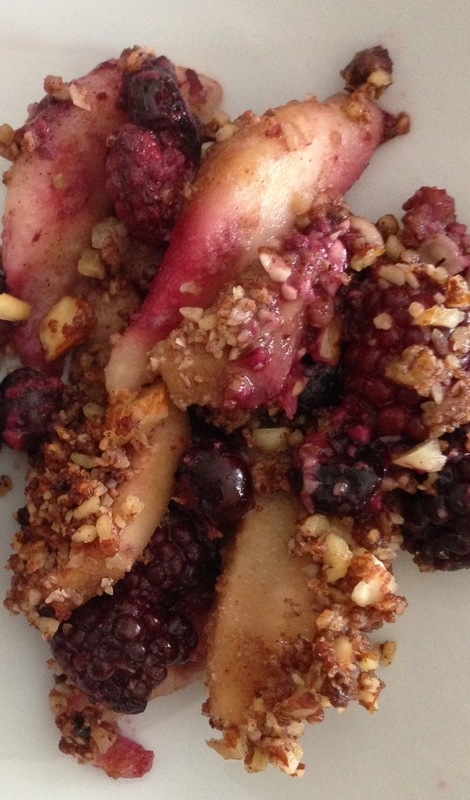 2 – In a large bowl, stir together pears, berries, lemon juice, coconut flour, salt, cinnamon, and allspice. 3 – Put all topping ingredients in a food processor and pulse until it resembles oats. 4 – Pour fruit into casserole and spread topping evenly over it. 5 – Bake for 35 minutes. Oh mercy, y’all, this was SO good. I bought more pears last night so I can make it again very, very soon. I love that it requires no added sweetener and yet tastes perfectly delicious. I’m mulling over how to make a similar crisp but filled with strawberries and rhubarb, for spring – but that seems like it would be too tart not to require some sort of sweetener in the filling, doesn’t it? At any rate, I continue to highly recommend this book. I got it for Christmas and have loved every recipe I’ve tried in it. There are lots of things in it that you can’t make if you’re on Whole30 (paleofied baked goods), but there are plenty of Whole30-approved yummies in there, too. 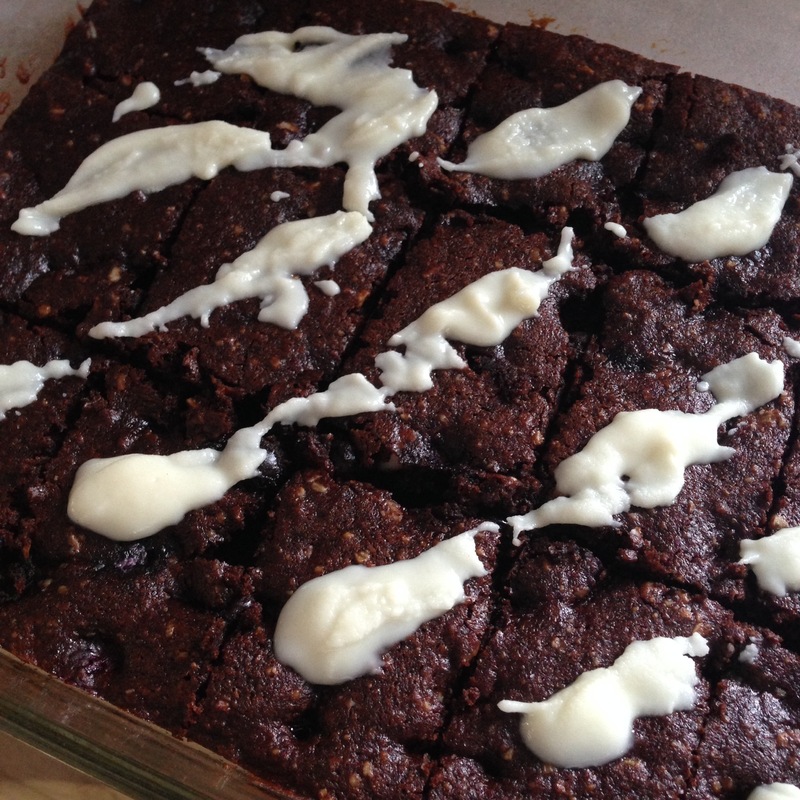 (This particular recipe only includes Whole30 approved ingredients, but I waited till after Whole30 to try it since it does seem to be a paleofied baked good). Do you have the book? If so, what are your favorite dishes? I finished my Whole30 earlier this month but still have lots to say about what made it doable and even enjoyable for me. I’ve heard from lots of folks who are interested in possibly giving this a go, and who have asked for more information. If you are only here for the knitting, my apologies! I promise I am not turning this into a food blog (though from the beginning, I’ve always shared my foodie adventures here). There will be knitting content coming soon! Maybe even a finished project! I blogged about my Whole30 experience here (note about the title of that post – I know that “real food” means lots of things to lots of people. What I mean when I say “real food” is “unprocessed” – food as close to its natural state as possible.) 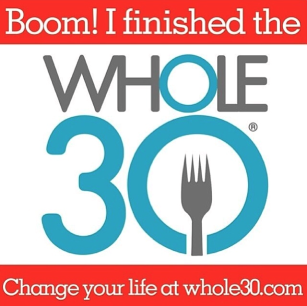 Whole30 is a concept started by the people at Whole9 – it’s a short-term nutritional reset “designed to help you put an end to unhealthy cravings and habits, restore a healthy metabolism, heal your digestive tract, and balance your immune system.” The basics are: no sugar (or any other added sweetener – natural or artificial), no dairy, no grains, no legumes. You basically cut out the stuff that can lead to inflammation, imbalances, and cravings. So what do you eat? Plants and animals! That means egetables, fruits, nuts, eggs, and meat. The entire program is outlined and explained in the Hartwig’s book It Starts With Food: Discover the Whole30 and Change Your Life in Unexpected Ways . I bought this book last spring, and loved it – it is so sane and balanced and straightforward. But it took me several months to actually take the leap and try the Whole30 – I honestly didn’t think I could really do it (especially letting go of sugar). I’m still surprised at how manageable I found this to be. I still refer to the book regularly and would highly recommend buying it if you are even considering exploring or experimenting with this way of eating. But the Hartwigs are cool – you don’t have to buy their book to get the basic information and support to give this a go. You can check out all the steps, and even get forum support, on their Whole30 site. Their approach laid the foundation for my nutritional reset, but there were actually a few other resources I found absolutely invaluable. Actually, I would say there are three women who became my mentors, in a way: Melissa, Michelle, and Steph. It’s funny, a lot of the first writings that introduced and popularized paleo were written by men. But these three women (in addition to the Hartwigs) are the ones that made it work for me. Melissa Joulwan – Her book, Well Fed: Paleo Recipes for People Who Love to Eat offers a really great, efficient approach to meal preparation. 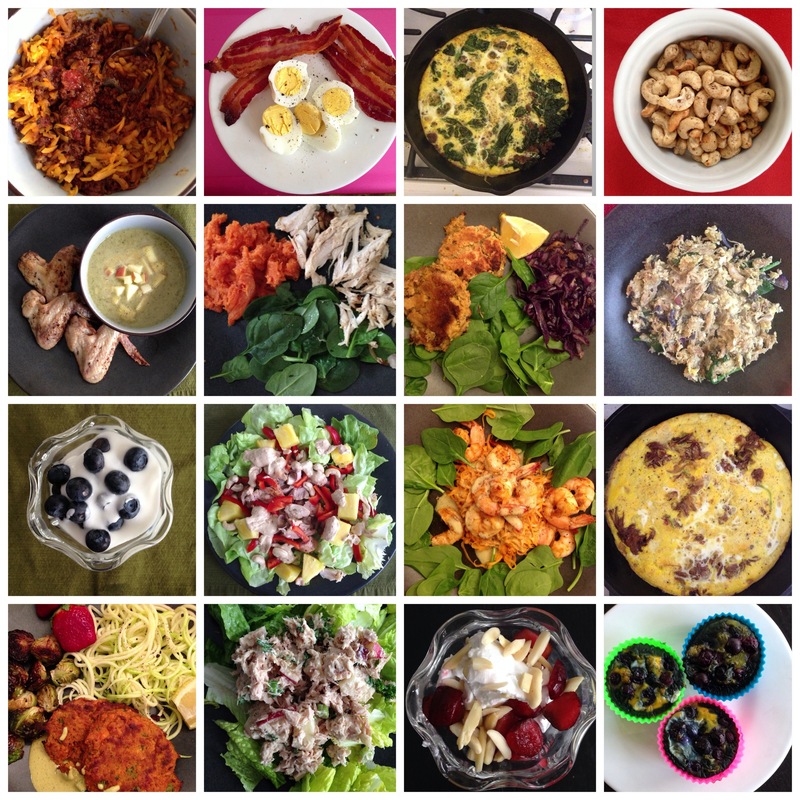 I am not going to lie – if you do Whole30, you will spend a lot of time in the kitchen. If you aren’t eating processed, prepackaged food, there is just no way around that! But Melissa shows you how to make it work with what she calls “weekly cookups,” so that you have the building blocks of great meals in your fridge during the week. I haven’t mastered her approach, but even what parts of it I’ve been able to do have helped so much in terms of being prepared for good eating, even during busy weeks. 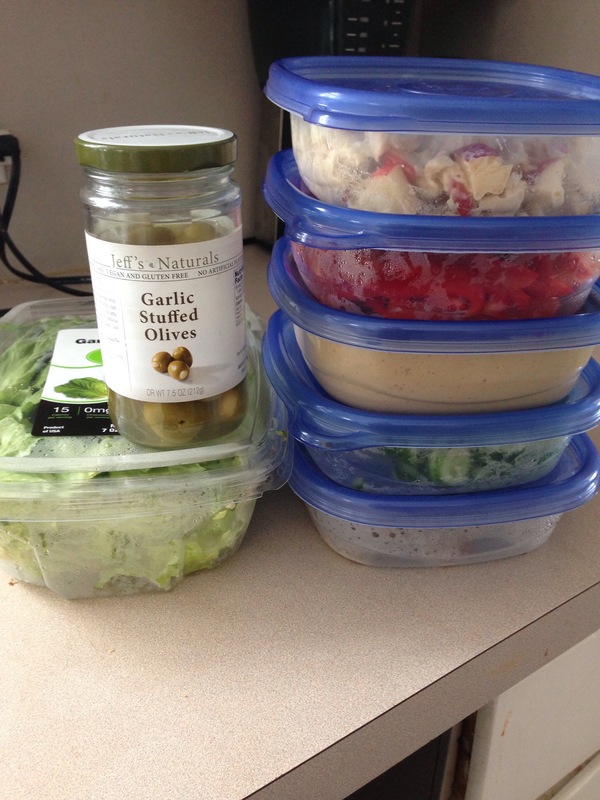 My work schedule always involves night meetings and weekend responsibilities; even so, I found preparing my meals to be totally doable, thanks in large part to Melissa. It’s her approach to cooking that’s especially helpful in this book, but the recipes are fantastic, too. Some of my favorite recipes from this book include Chocolate Chili (YUM – I like to add shredded, sautéed sweet potato to the top), Waldorf Tuna Salad, Olive Oil Mayo (I had a paleo mayo fail before finding her recipe and its easy, step-by-step instruction for getting the emulsion right), Caramelized Coconut Chips, and Sunshine Sauce (not a Whole30 recipe unless you can find sunflower butter without added sugar). 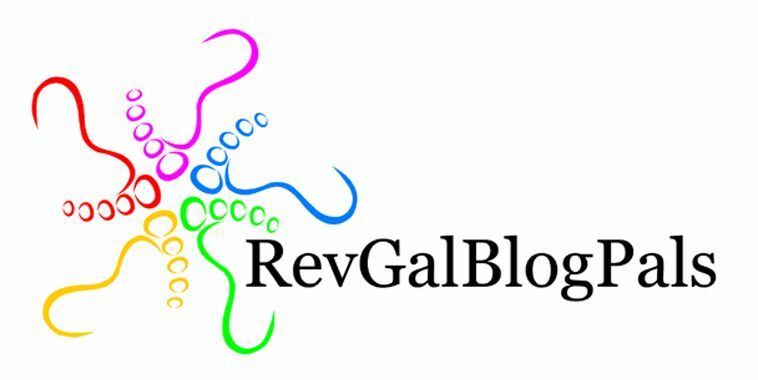 Also check out Melissa’s blog, The Clothes Make the Girl, for great recipes and tips. Last month, she offered some weekly meal plans for Whole30, based on her Weekly Cookup concept. Late in my Whole30, I decided to purchase Melissa’s newest book, Well Fed 2: More Paleo Recipes for People Who Love to Eat, and I took advantage of Amazon’s new (to me) feature – I bought the book in paperback and Amazon offered me the option of spending an additional $2.99 to get the Kindle version as well. Score! I love having actual books to hold in my hand, especially when I’m first getting the feel of a book and its recipes, and especially if it has great photos (as this book does). But I prefer using my iPad when I’m actually in the kitchen. I have a tiny little kitchen, and a cookbook that has to be propped open can take up precious space, whereas my iPad fits perfectly on a little shelf up out of the way. One thing I love about this book is the delicious array of sauce recipes. Love me some sauces and dips! Michelle Tam. Oh, NomNomPaleo, how do I love thee? Let me count the ways. I found Michelle’s site last spring and have been obsessed with her recipes ever since. She’s hilarious and her approach to cooking is just so fun. I love the whole aesthetic of her site, too. I purchased her app last spring and it is AMAZING. I can hardly express how much I love this app for cooking. Better than a cookbook, in a way, because of how easy it is to find exactly what you need, exactly when you need it. The app operates seamlessly – no extra steps involved in finding what you’re looking for or flipping back to what you were just looking at. It includes pictures of every conceivable cooking step. It has a whole section for all the recipes that are Whole30-approved (a lot of them). It’s got a Paleo 101 section that I still refer to often, and it even includes suggestions for 30 days of meals. Even though I have the app, I asked for and received Michelle’s new book for Christmas. Nom Nom Paleo: Food for Humans is fantastic. It’s so much fun to look at and read – even my kids enjoy looking through it. The cartoon figures of Michelle’s kids (saying funny things) are very appealing to them. One of my sons also just loves saying, “Nom Nom Paleo!” at random times. The book has many recipes that are not in the app or on Michelle’s website. I’ve made a lot from this book but also feel like I’ve barely scratched the surface. (Now that I’m off Whole30, I specifically can’t wait to make Mexican Pot de Creme!) Michelle is also really active on Instagram, and it’s fun to interact with her there (and I have a total fangirl reaction whenever she “likes” one of my food pics!). 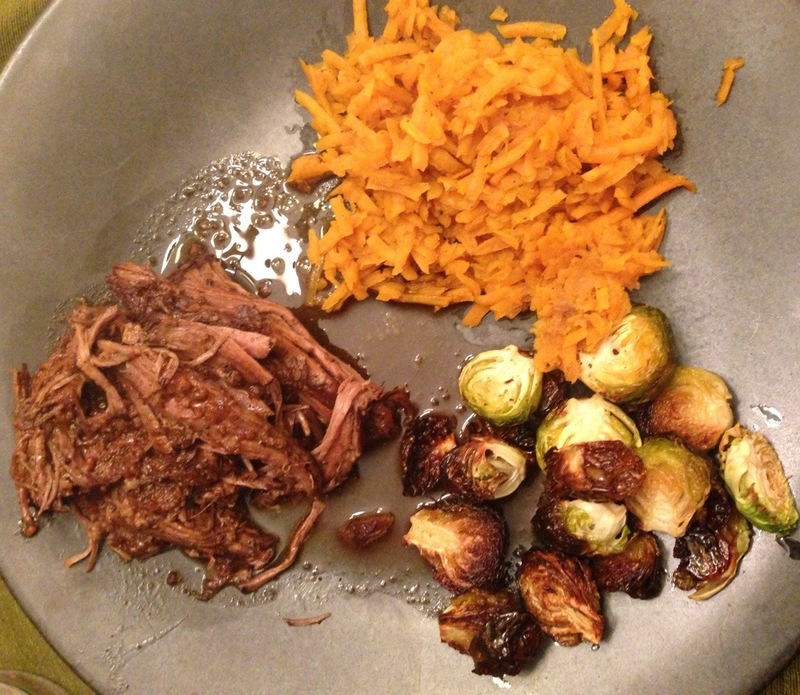 Stephanie Gaudreau – I stumbled onto her site, Stupid Easy Paleo, last fall, when I was looking for a great pot roast recipe. Her recipe for Crock-Pot Mocha-Rubbed Pot Roast certainly fit the bill and immediately became my go-to pot roast. LOVE it so much. From there, I discovered many other wonderful recipes on her site, as well as lots of great information and encouragement. Steph is also really responsive to any comments left on her blog, which is super. She just released a book earlier this year, The Paleo Athlete: A Beginner’s Guide to Real Food for Performance . I haven’t finished reading it yet, but I am loving it so far – very practical and helpful, with great recipes. Her recipe for Sweet Potato-Applesauce Mash has finally converted the one holdout in my house (one of my sons) to loving sweet potatoes. YEAH. I have lots more to say, as usual, but I’ll stop for now, except to add a couple more notes. I know some people who are vegetarian are interested in exploring this. The Hartwigs do address this in their book – it is doable, contrary to popular belief. Also, if you are someone who would like to explore paleo but want to include cheese (which I believe is considered “primal”), I would recommend checking out Mark’s Daily Apple. I need to add that none of these people know me. No one asked me to write this post and spread the linky love around. I’m just wanting to give a little shout-out to the folks who helped me the most, and to share these resources with others who might benefit from what these people have to offer. So, what about you? If you have tried Whole30 or have been eating Paleo, what and who are some of your favorite resources? My kids had midwinter break last week (how is this a thing? why do kids need a weeklong break just six weeks after winter break? and then in six more weeks, they’ll get spring break!). Anyway, I decided to take the boys down to Georgia to see my parents. It’s 825 miles door-to-door, and since my husband was not taking this trip with us, all those miles were on me. On the way down, I drove a little more than halfway and we stayed at a hotel on the border of Kentucky and Tennessee – I have never felt I could manage the entire huge drive by myself in one day without someone to trade off driving duties with. But on the return trip, I surprised myself by driving the whole thing all in one go. Would it be too much to credit my new paleo ways for this accomplishment? I don’t know. I do know that I am feeling pretty happy with how I managed, food-wise, on the road. And since I did a lot of blog-reading to figure out how to make this work, I thought I would record what I did, in case it helps anyone else. 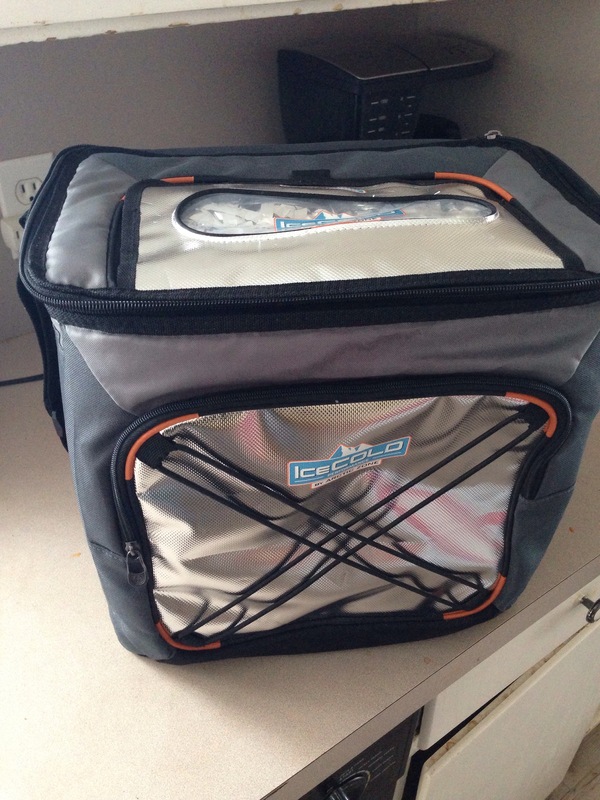 I bought this cooler – Arctic Zone 30 Can IceCOLD Cooler (mine’s an older version) a few years ago, when I was following Eat to Live, with big ideas of eating well on the road. I LOVE this cooler, but my grand ideas of eating only good, homemade food on road trips – well I never quite managed it. I decided this time, I would try again. I bought a little set of Glad plastic containers, which seemed simpler than packing all my regular storage containers. The first travel day was six hours (430ish miles). I snacked on the veggies and sunshine sauce and ate tuna salad on lettuce for dinner. I didn’t feel snackish after we arrived at our hotel a little after 10:00; what I ate in the car was sufficient. The next morning, at the hotel continental breakfast, I ate a couple of boiled eggs and a couple of sausage links (in general, I try not to eat conventionally-raised pork, but I do make occasional exceptions). In the car, I had a couple of clementines. Lunch on the road was more tuna salad. I snacked on veggies and dip. My time in Georgia wasn’t pure paleo. I cooked for myself for breakfast and lunch each day (I even found grass-fed ground beef at the Publix down there! ), and the boys and I went out for dinner with my parents each night. I checked menus online each time before going out and decided ahead of time what was the best paleo option. It went really well. I did make my dad a very non-paleo birthday cake – a recipe my mom used to make for my own birthdays – and I enjoyed every bite of my slice(s!). Blend everything in the food processor and eat up. I was really pleased with how this turned out. I think I still prefer the Well Fed version, but this was pretty darn yummy with my bell peppers and cukes. I also whipped up some five-spice cashews (recipe from the Nom Nom Paleo iPad app) and some Waldorf Chicken Salad (using the tuna salad recipe from Well Fed as my starting point). So on the trip back, my cooler and car looked essentially the same as on the way down, with a couple of substitutions and the happy addition of cashews. I had wanted to make a frittata for breakfast before hitting the road, but I was out of time. So when I stopped to pick breakfast up for the boys at McD’s (no judgment, please), I grabbed a sausage biscuit for myself, ditched the biscuit, and wrapped the patty in a crisp leaf of green leaf lettuce. It was tasty and held me for a good long while. Late morning, I stopped for my first Starbuck’s in seven weeks. WHAT. I KNOW, RIGHT? My standard Sbux drink is a triple tall latte (no sweetener, no flavor, just the classic goodness of espresso and milk), and since I was doing no dairy on Whole30, that was out for the duration. If I’m going to be drinking something other than a latte, I prefer my own home-brewed coffee to anything I would buy at Starbuck’s, so I just didn’t darken the door of my local Sbux during Whole30. And even since being done with Whole30, I haven’t been inclined to mess up my nice even-keeled energy each day with an espresso drink. I’m sure my baristas wonder what happened to me. At any rate, for the long trip home, I decided to treat myself to a triple tall latte, and it was sublime. For lunch, we stopped at the Kentucky Welcome Center (roughly the halfway point) and ate at one of the picnic tables outside (I had chicken salad on lettuce) before taking a nice walk around the grounds. By dinnertime, I was ready for something different, so I scouted out a Chipotle and got myself a salad with carnitas, veggies, two salsas, and guacamole. Perfect. I drove 825 miles that day (12.5 hours of drive time, and a little less than an hour and a half for stops). Typically, when my family takes road trips, I don’t drive more than a few hours before switching places with my husband, because I tend to get drowsy very quickly. It was a real surprise to me on this trip that I never dealt with that feeling. Sure, I got tired of being in the car, but I never felt like I was having a hard time staying awake (if I had, I would’ve stopped and stayed in a hotel rather than trying to do the whole trip in one day). Maybe I’m wrong, but I attribute this to the sustained energy and focus I’ve found from eating the way I’ve been eating. Without those grain-based carbs (flour, sugar), I just don’t have the spikes and lows in energy I have often had in the past. To undertake a 14-hour solo road trip in one day and to arrive home feeling not much worse for the wear – well, it’s just one more piece of evidence that this is working for me. So that was my paleo road trip. I was very happy with the preparations and provisions I made for myself for this little adventure. In the future, I might add an additional dip, some baby carrots, a few boiled eggs, and some homemade Larabars. Yum – I’m already looking forward to my next trip! If you’re looking for a way to use up cranberries left over from Thanksgiving, I can’t recommend this quick bread highly enough. I made a loaf for company on Thanksgiving morning and it was gone in a flash. I still had enough cranberries in the fridge to make another loaf this morning. This is my adaptation of a recipe from Veganomicon, which was most likely adapted from an old Fannie Farmer recipe. I used to make muffins quite similar to this, and this recipe could easily be made as muffins (with a much shorter baking time at a higher temp – 18-20 minutes at 400; I always dusted mine with powdered sugar once they were cool). I replaced the soy milk from the Veganomicon recipe with more orange juice, primarily because we had a guest with a nut allergy who also stays away from soy products (often made on equipment also used for nuts). I don’t eat soy either, except occasionally in tempeh form. Ordinarily I substitute almond milk for soy in all recipes, but this time I didn’t because of the nut allergy. I liked the extra orange-y flavor of using more oj instead, so I am going to make it this way from now on. 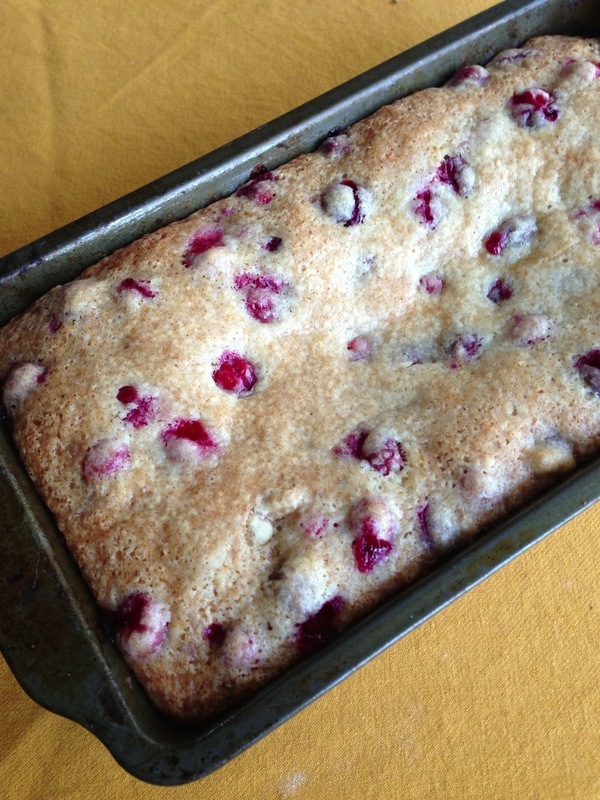 Fold in orange zest and cranberries, and pour into prepared loaf pan. Bake for 1 hour. Let bread cool in loaf pan for about 15 minutes. Release onto cooling rack, turn right side up, let cool a bit more, then slice and eat. This is such an easy and delicious recipe – the only hard part is waiting for it to bake and cool! Happy Thanksgiving to my American friends. I hope it has been full of goodness, gratitude, and all things yummy. Last year on Thanksgiving, I made a little list of things I wanted to remember about the day. I am so glad for that list, y’all! I have referred to it so many times in preparing for today’s meal (especially to find my turkey recipe). So without further ado, here are some of the things I want to remember for next year (and beyond). 1 – TURKEY. I am so so happy to have started using this recipe last year. 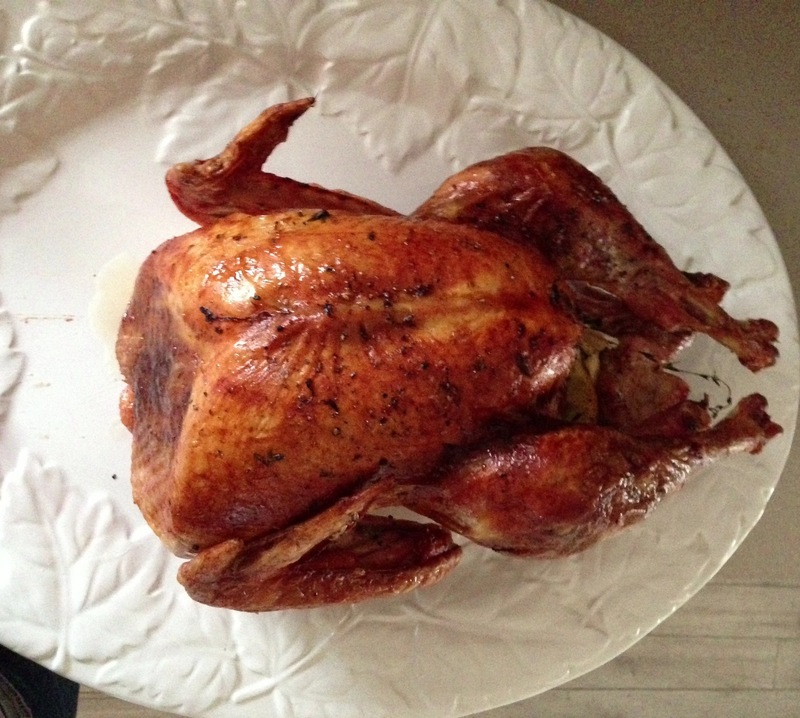 It’s Ina Garten’s perfect roast turkey, and I would definitely say that it is perfect. After years of experimenting with wet brining and dry brining, I’ve decided that simple is actually superior. This is so moist and flavorful that I find myself thinking I might want turkey at other times of year (which I say as someone who has never been a big fan of turkey). 2. Another same thing as last year – Gravy I went with what I came up with last year. LOVE it. 4. Dessert – I like to break out my trifle bowl whenever possible, and this year I went with a new trifle. 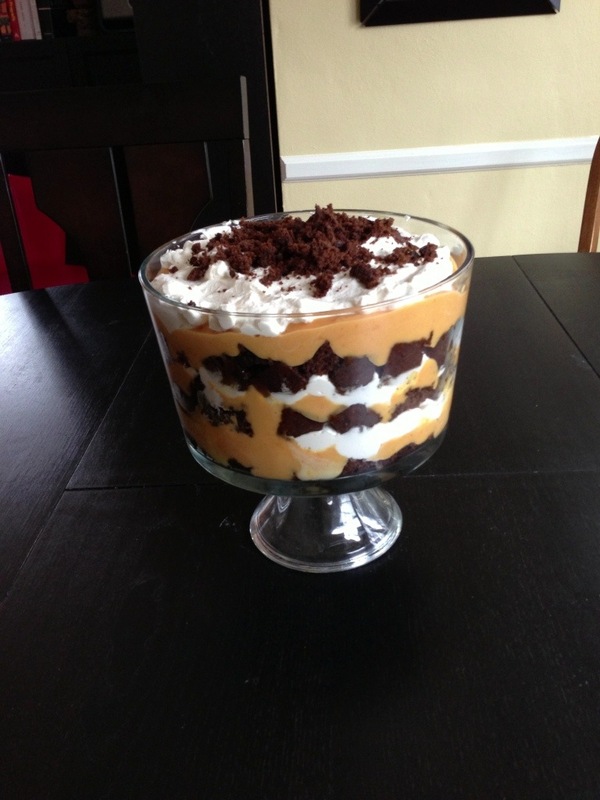 Pumpkin Gingerbread Trifle. I had originally marked a recipe for this from Epicurious, but in the end I went with the Brown Eyed Baker’s version. It was a win, win, win, y’all. I was super-happy with how this turned out, and I will definitely be making it again. You should all make it, too. It is almost entirely from scratch (except one little box of pudding mix) and it is really not hard to make. I would highly recommend this recipe. My other dessert (I usually have at least three for Thanksgiving – did four last year – but in a rare stroke of sanity, I narrowed it down to two this year) was vegan – a dark chocolate cake with a dark chocolate mocha ganache (vegan). There are some other things I want to remember, y’all, but I’ll have to write them down later, because I am totally pooped. I hope you have had a great day, wherever you are, and whatever you’ve eaten! Between Smitten’-knittin’ and getting the house ready for company, I don’t have a lot of time right now, but I did want to pop over for a minute (and not break my NaBloPoMo streak – I’m in the homestretch!) and show you my current snack obsession. Oh mercy, just writing this makes me want to roast some. As I’ve mentioned before, when I pull these out of the oven, I can hardly keep myself from just standing there at the stovetop, eating the sprouts off the tray. But I found something I like even better. 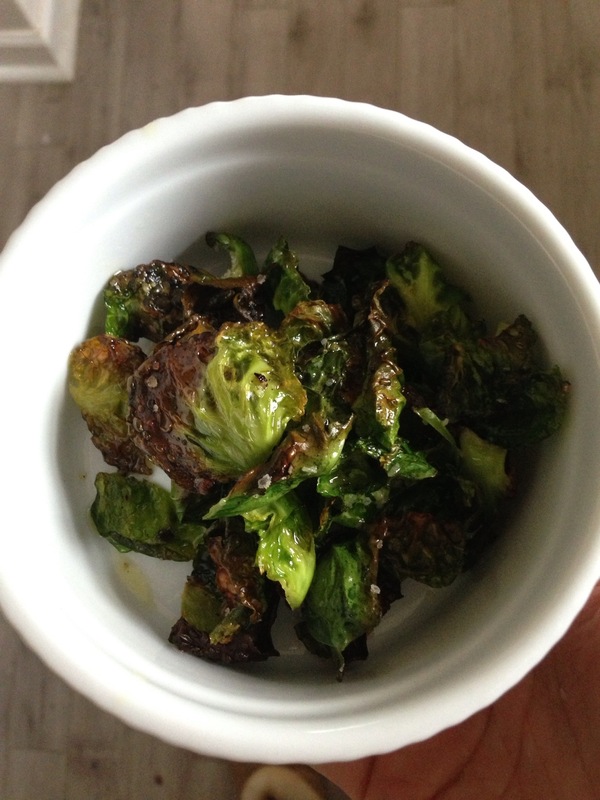 NomNomPaleo’s Brussels sprouts chips. Oh, people. OH, PEOPLE. These are so good. If you like Brussels sprouts (or even if you don’t), and you haven’t tried this yet, I would highly recommend it. I’m now trying to keep Brussels sprouts in my fridge at all times so I can make these chips. Just a brief break on a busy day to show you my new favorite cold weather breakfast (and right now it’s 25 degrees with a wind chill of 11 and occasional snow, so yeah, it looks like cold weather is for real here now). As I’ve mentioned before, for the last several years I have started most days with a green smoothie (1/2 C unsweetened almond milk, 1/2 C pomegranate juice, a few raw almonds, 1 banana, a couple of handfuls of raw baby spinach, 1 C frozen blueberries – so yummy!). But sometimes it’s just so cold I really want a hot breakfast, especially after I’ve gone for a run. Since I’ve been enjoying trying out some Paleo recipes lately, I thought I’d give a hot Paleo breakfast a try. For the last several days, I’ve been enjoying this N’Oatmeal Recipe (Oatmeal Minus the Oats) from Taylor Made It Paleo. Mine isn’t as pretty as hers but it is 100% yummy. 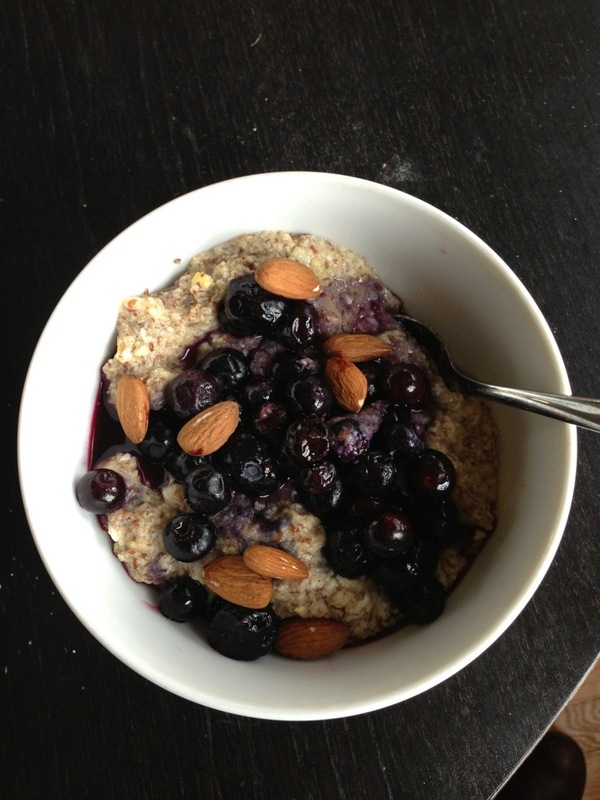 I top mine with a cup of blueberries and a handful of raw nuts, whichever kind I’m in the mood for. SO YUM. 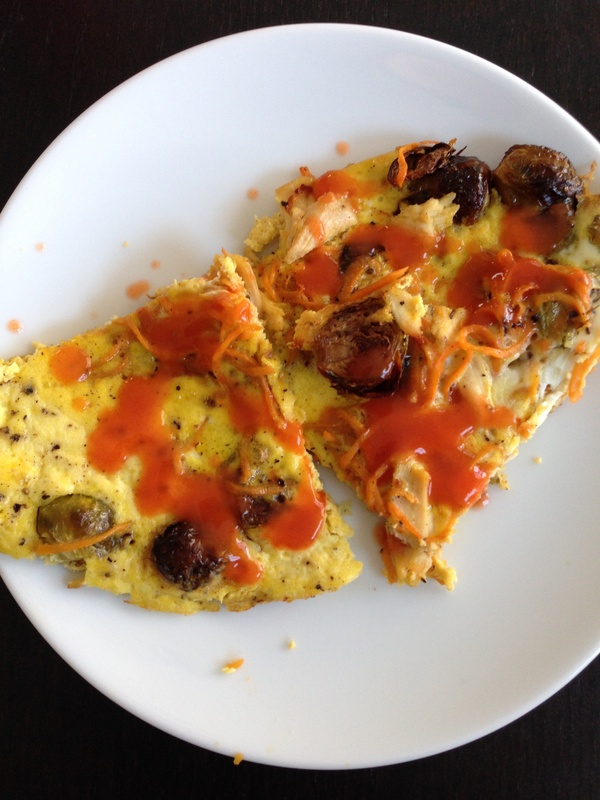 Do any of you have some hot paleo breakfasts that you enjoy? It is snowing here tonight and I wish this delicious hot meal were in my stomach but this was actually a week ago (and I am still thinking about it). (Sorry for a not-great picture; I was too hungry to take the time to get out my camera). This is the recipe that led me to Stupid Easy Paleo. I went looking for “paleo pot roast” and this one had me at the word “mocha.” It is SO yummy, y’all. When I heated up leftovers a couple days later, I actually moaned as I ate it, and I said to My Old Man, “Wow, this is even better than I remembered,” and he said, “That’s funny, because you were making those same exact sounds the first time you ate it.” I guess it’s not very humble to make such noises over your own cooking, but I can’t help being honest, y’all. I was out of the figs the recipe calls for (and couldn’t find them at my local grocery), so I substituted 1/3 cup dried cherries (worked out perfectly). Check out the original recipe here. I served it with sauteed grated sweet potato (seasoned with Chinese 5-spice) and roasted brussel sprouts (O, brussel sprouts, you might be my favorite!!). This recipe was a winner all the way around, and we will definitely be having it again. There is nothing like coming home on a dark, cold night to a hot pot of delicious roast.